Walk Softly: Free at Last! /Hawks Aloft Inc. Walk Softly: Free at Last! Once in a while a really nice thing happens and I was fortunate to share in one particular instance’s successful conclusion. In mid-December in Ontario, Canada, Scugog Councillor Betty Somerville and her husband Len were driving on Simcoe Street north of Port Perry and noticed a large bird, obviously in distress, on the side of the road. As they watched, the bird flopped around in the ditch, clearly injured, so Len cautiously approached the bird and placed a coat over it to calm it. Wild birds can be very stressed when injured, so it is critical to first decide if you can catch it without causing further harm or if you should seek help from a professional first. Due to the location of the bird near a busy highway, as well as the remoteness of the location, Len and Betty decided to try the rescue. They knew they needed to act fast as the injuries appeared severe, so they drove to the Scugog Animal Hospital, where Erin Forget, a registered veterinary technician, examined the bird. Clear signs of trauma were noted and the bird appeared weak, spastic, and had trouble holding its head and wings in place. After some preliminary x-rays, it was confirmed that the bones were undamaged–lucky! Soft tissue damage and trauma could be dealt with, but not at the vet clinic. So, the bird was carefully bundled up and sent off to Pefferlaw, where Gail Lenters of Shades of Hope Wildlife Refuge, a privately run wildlife rehabilitation center, and Dr. Sherry Cox of the National Wildlife Centre in Caledon East, took over the care. Their examination and x-rays likewise confirmed that the bird didn’t have any broken bones but was traumatized, had suffered severe bruising and exhibited some neurological signs of head trauma, but no permanent harm was expected. Slight bleeding in the eye and an inability to perch added to the treatment considerations. 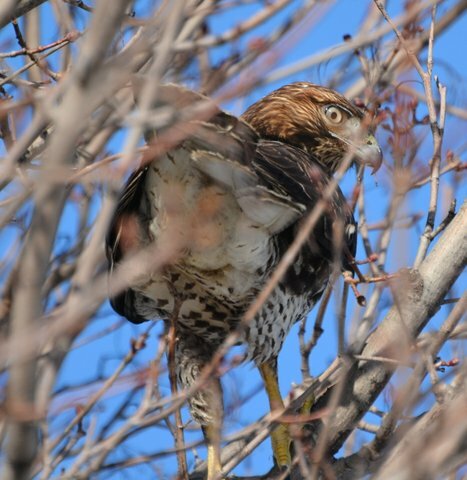 The hawk was very thin, which is often noted in young birds which haven’t learned how to hunt effectively. Administering fluids, anti-inflammatories, food (cut up into bite-size morsels), TLC, and patience showed rewards, and in a few days the bird was eating well and starting the long road to recovery. Time and care would heal the bird for its eventual release. Once Gail was satisfied that the damage had been repaired, the swelling had subsided, balance re-established, and the bird was gaining weight, rehabilitation began in a small outdoor cage where the hawk would learn to use its wings again and regain strength. From here it was transferred to Sandy Pines Wildlife Centre in Napanee, where Sue Meech took over the rehab. A large flight pen allowed the hawk time and space to hunt and gain full wing strength. After about two weeks, back he went to Pefferlaw for the final stages of treatment and then back to Betty and Len. Wow–what a journey! 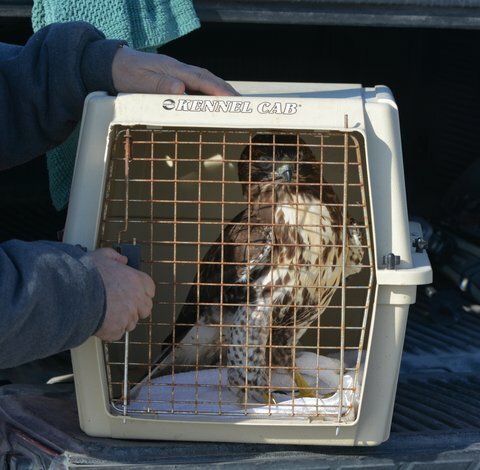 The rehabbed Red-tailed awaits release in Ontario, Canada. Photo by Geoff Carpentier. 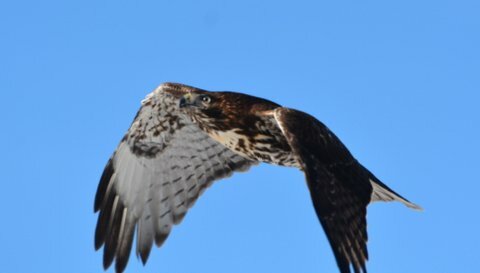 On February 20th, I was invited by Betty and her husband to share in the release of the bird—now confirmed to be an immature male Red-tailed Hawk—at their Scugog farm, near where the bird had been found in December. Resting on the bed of their pick-up, the hawk cowered in the transport cage for a few moments as we patiently waited for it to realize that freedom was at hand. Soon it took the cue and flew out of the cage, circled over our heads, panicked some pigeons on the barn and then tried to land in the wild for the first time in almost two months. But the landing was flop. 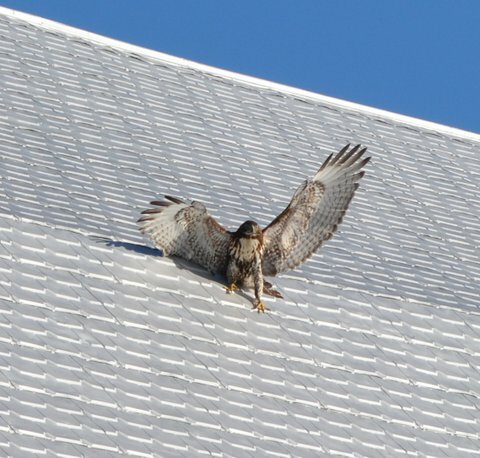 Heading straight for the barn, it tried to land on the roof, but it was a metal roof and it was slippery! Instead of perching safely and then leisurely taking time to get its bearings, panic set in as the hawk slid down the slick surface, as if on a toboggan. Realizing the peril, we watched in anxious anticipation but the hawk took care of his own fate and lifted off, circled again and this time landed in a tree. As it preened, it searched the area for landmarks it knew. In the distance, another Red-tailed Hawk flew past, not seeing our little guy, but he saw it! Maybe, if it is a female, he will have a family of his own this year. I suspect the first lesson he will teach his young is to avoid those big shiny cars that can hurt you. Perhaps the second will be: Don’t land on metal roofs! Thank you so much to Betty, Len, Erin, Sue, Sherry, and Gail for caring so much about our wild things! All these organizations rely on donations and public funding to support the great work they do. Please consider supporting them when deciding on your gift-giving choices. A bad place to perch. Photo by Geoff Carpentier. As a side note, please remember that your good intentions may not always be the best option. If you find a wild bird or mammal don’t always presume it needs your help. A baby bird fallen from the nest may be just fine if left alone. Injured animals on the other hand need help, and often the best action you can take is to call someone like Gail, Sherry, Sue, or Erin to seek advice and then decide what to do. If harm is imminent then you should act as Len and Betty did, but always be cautious in your zeal. Never ever try to keep wild animals as pets. It is illegal without special permits and never advantageous to the animal. Their place is in the wild. Whatever you do, if you find an animal in distress, thank you so much for even caring enough to try to help. At home again in the wild. Photo by Geoff Carpentier. On another quick note, thanks to one of my readers I was alerted of a Great Gray Owl here in Durham–finally! Please keep me posted on other owl sightings! Geoff Carpentier is a published author, ecotour guide and environmental consultant. Visit Geoff online at www.avocetnatureservices.com and on LinkedIn and Facebook.